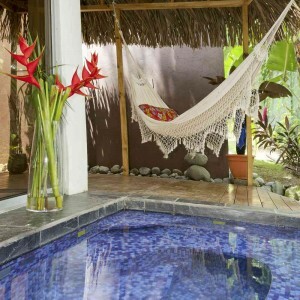 Manuel Antonio Beachfront Rental at Costa Rica Looking for Manuel Antonio beachfront rental in Costa Rica? EOC is the best place for you. Book now and get perfect deals any of our Costa Rica family vacation packages. What does the perfect Costa Rica family vacation look like? 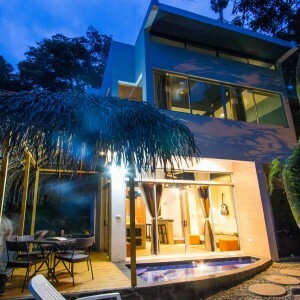 How about staying in a new modern luxury villa that is only a 30 second trail walk to one of the most amazing beaches in all of Costa Rica, a 5 minute walk to the world renowned Manuel Antonio National Park, and a complete immersion into one of Costa Rica’s most energetic tropical rainforests! Oh and don’t forget your own private swimming pool to relax in day or night. We expect that the villas, with their eco-friendly design and several cutting edge technologies, we will reduce the impact we have on the local environment, especially to our local visitors: the monkeys, birds, butterflies, sloths, and anteaters. 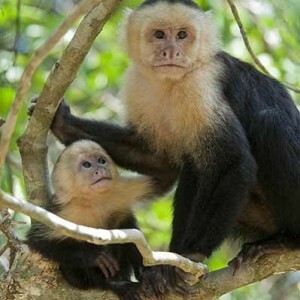 This means your Costa Rica Family Vacation at EOC will actually help protect and preserve the natural beauty of Manuel Antonio, Costa Rica. The land on which the EOC villas sit is a unique ecosystem hosting wildlife, plants and birds that cannot be found in the same combination anywhere else in the world! We have delicately partnered with this phenomenon by bringing sensitivity and intention into the creation of each EOC luxury villa. 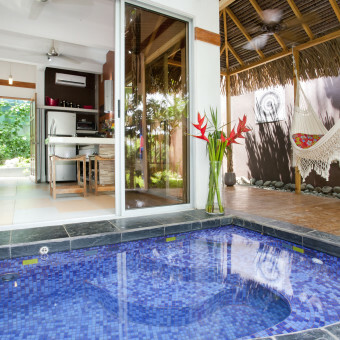 This is just one of the many reasons we are quickly becoming one of the most sought after Manuel Antonio vacation rentals. 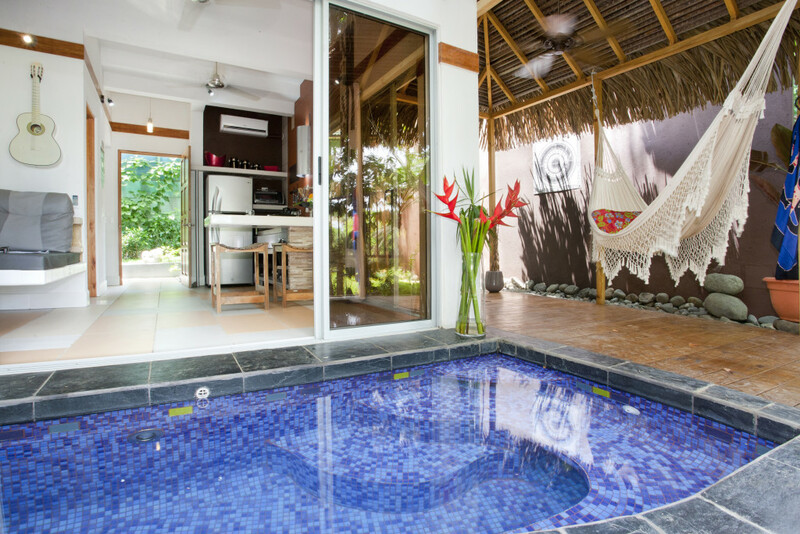 Utilizing the absolute best local resources and creative architectural, artistic designs, each of the 4 villas uniquely invites you into their warm Costa Rican “nest.” These 2 bedroom bungalows provide a sacred space for a couple vacationing and celebrating a special event or a homey environment equipped for families. Downstairs includes the full kitchen, full bath, living room and splash pool. Upstairs includes two rooms with king and queen beds, a loft with a single bed and a full bathroom. 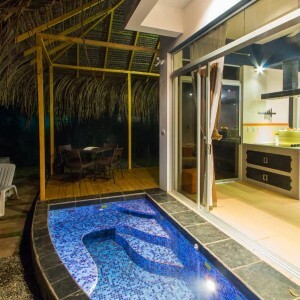 Each villa comfortably sleeps up to 5 people. The villas are also close enough to each other that 2, 3, or 4 villas could be reserved to accommodate parties up to 20 people. 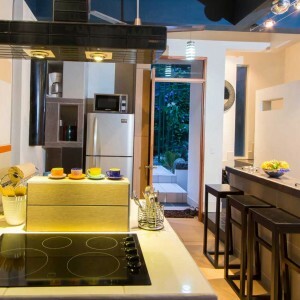 Additionally as an eclectic, unique, community project our villas are virtually the closest accommodations to the amazing Manuel Antonio beaches and its National Park. This allows you the luxury of walking to a great deal of activities, local restaurants and shops and supporting our local community. Another way to keep everything in balance and complete your EOC experience.